The yin yang sign is called a Taijitu or Taiji diagram. It represents the philosophy and principles of positive and negative or opposite energies such as male and female. The word taijitu means diagram of the supreme ultimate. 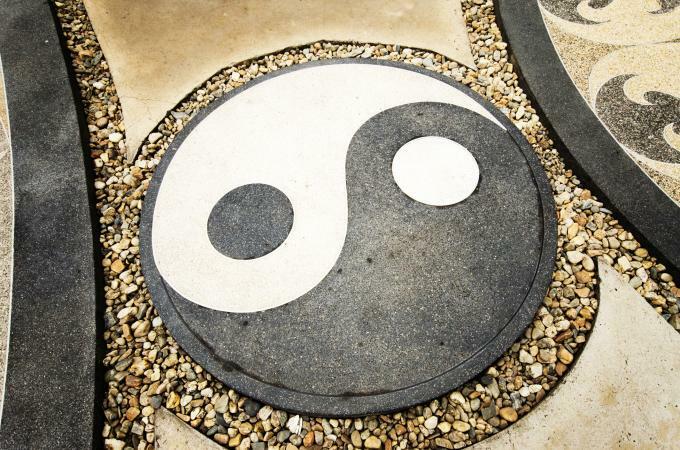 The origin of the symbol for yin and yang is controversial, but many believe it comes from the I Ching second character that is called The Book of Changes. The book places the sun on top and the moon on the bottom. The modern symbol is a stylized interpretation of this character. This sign of yin and yang is a divided circle of two tear-drop shapes of opposite colors - black and white. The right side, black, descends while the left side, white, ascends, creating a clockwise pattern of motion. Since the circle is whole, these two halves cannot be complete without the other. Black symbolizes its direct opposite or delusion. Night turns into day and day turns back into night. Birth ends with death and death ends with rebirth. Both halves of the symbol are curved and this creates a sense of movement as the halves narrow into a tail-like effect. Yang, the left side, is white while the yin, the right side, is black. This represents the opposite qualities of the two energies. It's important to note that within each curved half is another very small circle. This tiny inner circle is the opposite color and matches the opposite half. The tiny dot symbolizes how each side is dependent upon the other for its existence. The smaller circle also depicts transformation realized from the co-existence and dependency upon each other. It's a perfect sign to demonstrate how everything is connected and nothing is solitary in life. Each person, animal, plant, element and so on depends upon the others for its existence. Nothing can exist by itself. The yin yang sign is a symbol of completeness. This unity and oneness is created by the other half of matter, which is the opposite half. This is the law of nature and the only way any single being or element can find completeness. Oneness is found within the promise of the circle. Yin must have yang and yang must have yin or there can't be any life. There can be no balance. In Taoism this circle represents the very basic elemental energies of female and male which are the energies of all creation. 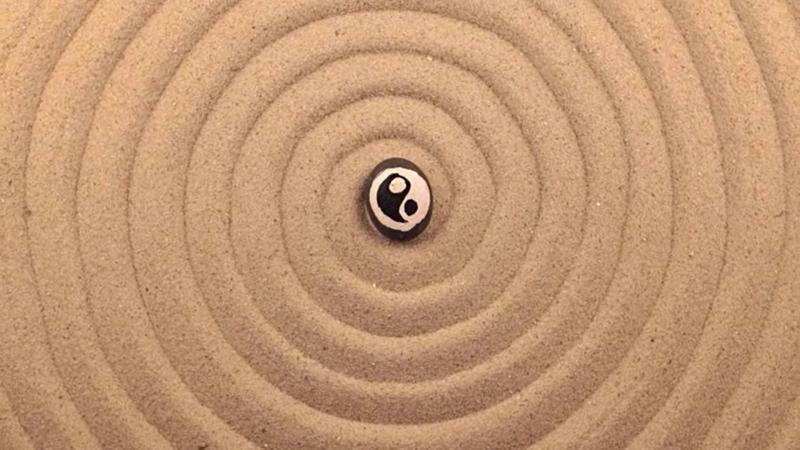 It's easy to become confused over which one of the two symbols is yin and which is yang. It's equally confusing are the elements that go with each. One easy way to remember is that yin translates to shady side. The shaded side of a mountain always faces North. The shaded side is dark and matches the black side of the yin yang symbol. Below is a chart to help you understand the female and male energies and which is assigned to yin and yang. It's interesting to note this symbol is found on Roman shields. The sign was used to distinguish which region the army was assigned, so it became a regional marking. There isn't any historical evidence to point to any connection between the Romans' use of this symbol to the Chinese use of the yin yang symbol. Another stylized symbol on a Roman shield were three circles inside each other and halved. The outer circle of one side was a dark hue while its matching opposite was a lighter hue. The next circle half was light while the opposite one was dark and so on. Third century Celtic art depicts a similar symbol that isn't always shown in opposite colors. South Korea's flag has a yin yang symbol of two colors and is depicted with the halves on top of each other instead of side by side. The yin and yang energies reveal that life is an illusion because things often aren't what they appear to be. In fact, many times situations and people are the opposite of what we believe or assume. The Taoist spelling of "yin qi" which means female chi and "yang qi" meaning male chi may create a misconception and the spelling ends up incorrectly as the ying yang sign instead of yin yang.